From London the band, consists of Guilhermino Ramos (triangle / vocal), Cassio Matheus (Zabumba / vocal) and Rodrigo Vasconcelos (accordion). They are part of the Forró de Londres Forró community and has been an indispensable part of the local scene for years. Guilhermino and Matheus are childhood friends who grew up together in Itacaré, Bahia, Brazil. As teenagers they discovered forró, during a period which saw the growing influence of forró bands such as Falamansa and Trio Virgulino. They began playing together, watching Luís Gonzaga’s concerts on DVD and teaching themselves to master the triangle and zabumba (drum) and to compose their own music. They discovered and fell in love with the traditional folk style of forró, which has shaped their music ever since. In 2013, Matheus and Guilhermino met Rodrigo Vasconcelos, a former accordionist from the band Chama Chuva, and now Forrobamba’s principle accordionist. Rodrigo is from Belo Horizonte, Minas Gerais, and started playing the accordion at the age of 16. Rodrigo draws his musical inspiration from artists such as Dominguinhos. Forrobamba released their first single, Café Na Cama, in March 2013. In January 2015 the band released their first album Balanco O Berço. 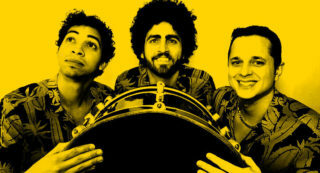 The album has been a huge success in the European forró scene and Brazil has led to Forrobamba playing at forró venues and festivals across Europe.